These printable patterns come in three different sizes for 4", 8", and 10" doilies. 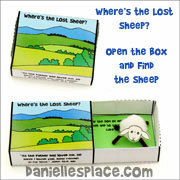 Use them as a craft for kids or for bulletin board displays. Doilies - Four-Inch Doilies, Eight-inch Doilies, and/or Ten-Inch Doilies, Combo Pack 12 each 4", 8" 10"
1. Print out the patterns that match the size doilies you are using. 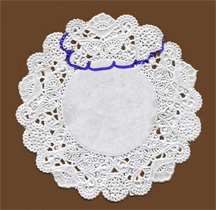 There are three different sizes of patterns for 4", 8", and 10" doilies. 2. Make copies of the patterns and cut them out. 3. Use a pink colored pencil to color in the ears, nose, and cheeks. 4. Glue the legs and head to the doily, and then glue on the ears. 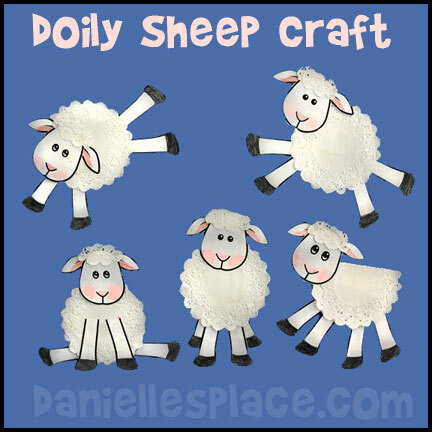 (You can also fold or cut off part of the doily to make a sheep that is standing sideways. 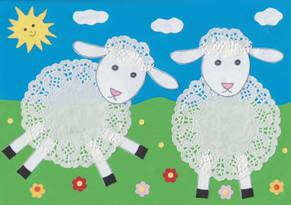 Use one doily to cut a cloud-shapes for the fur on the heads of the sheep. 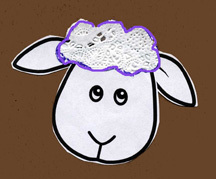 Glue the cut doily to the top of the sheep's head after attaching the ears. Výtvarné náměty a postupy pro děti made this craft. 1. Make the four legs first. Cut the side seams (the part of the cup that has been glue together) out of the cup and then squeeze the sides together rolling the sides over each other and glue them together with a hot melt glue gun. If you don't have a glue gun, staple them together. You want to make the top part of the cup much smaller. Do this for all four legs. Make a crease on both sides of the legs at the top of the cups so that the seams are on the bottom. Cut about one inch down on each side and slide them onto a dinner sized paper plate that is set upright so that the seams of the legs are facing down. 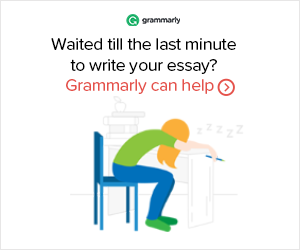 Glue or staple them to the plate. 2. Turn another dinner sized paper plate upside down and glue or staple it on top of the plate with the feet. 3. Paint the feet black and let them dry while you work on the head. 4. 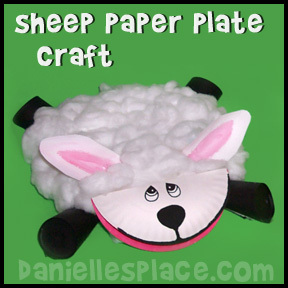 To make the head paint the top side of a snack sized paper plate pink for the mouth and let dry. Fold it in half when it is dry so that the pink is inside. 5. Cut out two ears from poster board and glue them to the back of the head. 6. Glue the head onto the body as shown in the picture. 7. Glue cotton balls all over the sheep's body. 8. Draw eyes on a piece of card stock, cut them out and glue them to the head. Draw in the nose and mouth. 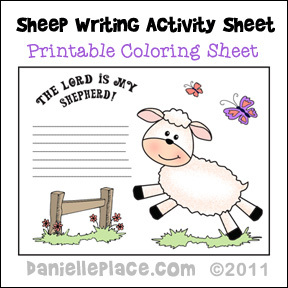 Have your children use this sheet to write facts about sheep, make a list of books they have read about sheep, or write a descriptive sentence about sheep. Read Russell the Sheep by Rob Scotton - The comic illustrations of Russell the Sheep and other animals along with the humorous story line will compel your children to read this book over and over. Russell the Sheep can't sleep so he tries everything he can think of to help him sleep from using a frog pillow to looking for a better place, but he has no luck until he has the brilliant idea to count things. 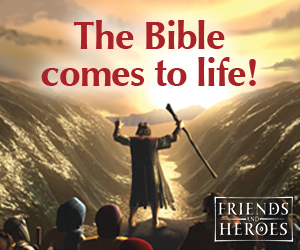 Check out Rob Scotton's web site for pictures from this book and others.